Parking lot paving is a big investment, and because of this protecting it and ensuring a full life is key in acquiring the best return in this investment. Additionally, as property management, you can be held liable if you do not maintain your lot. When it comes to housing complexes, especially those with HOA’s, budgeting in advance is particularly important because all costs for the year are usually presented at a board meeting, and require approval. In HOA communities there is typically a monthly fee residents pay to cover such upkeep and maintenance required. 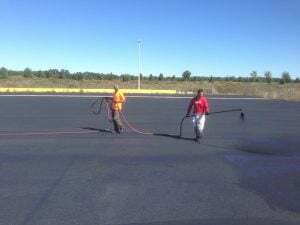 Each year, as a property management company, it is important to budget for parking lot repair as a part of your scheduled exterior maintenance plans. Asphalt repairs are the best way to preserve your pavement and to avoid wasting money by allowing your pavement to deteriorate prematurely. It is also the best way to avoid liability issues related to damages endured by unmaintained pavement. It can be hard to determine exactly what budget your will need for repairs, as they can vary significantly depending on how harsh a winter was and several other factors. However, come early spring, you can evaluate a few things to help formulate an accurate budget for the warmer months. Cracks – Typically cracks that are larger than .25 inches need to be filled and sealed. Potholes and larger forms of asphalt breakage usually begin with small cracks. When water penetrates these cracks, it creates weaknesses that lead to larger cracks and breakage. Additionally, if water penetrates the base of your pavement it can begin to compromise it. A compromised base will deteriorate quickly, and can often not withstand typical traffic loads. Line striping – Worn lines are not only unattractive, but they can cause traffic incidents and issues associated with markings not meeting ADA regulation requirements. Additionally, if parking spots are not clearly marked, it may cause major disorganization with parking, especially if residents have assigned spots. Sealcoating – Sealcoating is used as a preventative measure, as well as an aesthetic upgrade. When applied in conjunction with hot rubberized asphalt crack filler, the rate of deterioration drops. Sealcoating can also help to shield against UV radiation, as well as oils and fluids that leak from cars. Sealcoating is completed following repairs (like crack filling and pothole repair), but before line striping! Concentrating on these areas should help you to put together a general budget for your pavement repairs at the start of the season. 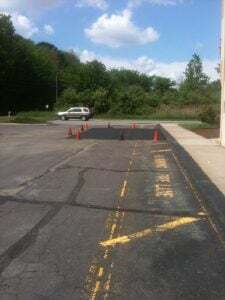 However, the professionals at EastCoat Pavement Services, can provide you with a free consultation to determine exactly what type of work you will need done based on your pavement’s current condition, as well as give you an accurate quote to help you to evaluate if you are budgeting properly. Before you know it, spring will be here, and we know winter takes a toll on your parking lot. EastCoat Pavement Services works with HOA complexes and property management companies on a regular basis, making us extremely experienced and efficient in this area of work! Contact us today for your free consultation, and get a jump start on budgeting for your spring projects!